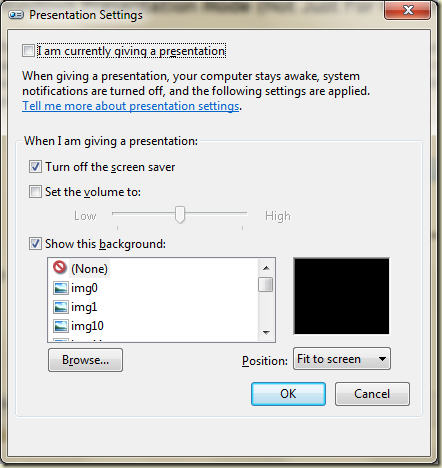 Presentation mode isn’t new (it was introduced in Vista), but it is handy. One easy way to turn presentation mode on is to type “present” into the Start menu search box and let Windows find the “Adjust settings before giving a presentation” item. From here you can turn on presentation mode and tweak some settings. Notice the help text says “your computer stays awake”. I turned on presentation mode today just to keep my laptop awake while it sat in a corner coping a 16 GB file over WiFi. Of course, presentation mode is useful when you have an actual presentation, too. In addition to the background, screen saver, and volume settings, Messenger will mark your status as busy and not throw toast on the screen (you’ll only get a blinky icon in the taskbar). Other applications can disable their notifications, too, but the author of the application has to write the code to be aware of notification state. Kirk Evans has an example. Unfortunately, presentation mode is only available on laptops by default. It turns out you can do a fair amount of presenting from a desktop with Camtasia (love it) and Shared View. Another handy executable is mblctr.exe. This program launches the Windows Mobility Center with a UI to tweak brightness, power settings, presentation mode, and more. This concludes my exuberant Windows tip of the day, I hope you found it useful. Thanks, Jim. Updated the post. This is very useful. I have been bitten by the sleeping laptop or unwanted toast a few too many times during a presentation. Thanks for sharing. I will definitely be using this. Sweet, I could definitely use this for my presentations. Plus it might be pretty handy for when I watch videos from Hulu on my desktop. What about for windows 7?